Has the novelty of the new presents worn off and left you wondering how to entertain the kids for the rest of the week? Well, today we have a helpful guest post from local parenting blogger, Missy (aka: the Marketing Mama) sharing inspiration and ideas for keeping the kids busy and content during winter break. It’s winter in Minnesota – more specifically, it’s winter break in Minnesota – the week between Christmas and New Year’s when children and parents stare at each other wondering what to do next. New holiday toys can keep everyone busy for awhile, but there comes a point when cabin fever takes over and you need to get out and have some old fashioned fun. Or at least learn something new. If you are running short on ideas, or simply need some inspiration, here are 10 activities to get you moving and having fun as a family. 1. Ice Skating – Nothing says winter in Minnesota like skating on ice. The Depot in Minneapolis has a gorgeous indoor rink perfect for novice or experienced skaters. Ice skate rentals, lockers and refreshments are available on-site. 2. 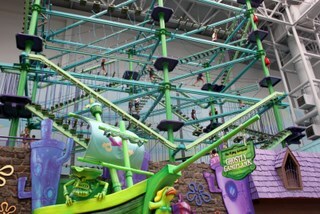 Mall of America – The high ropes course at Nickelodeon Universe is a great activity for older kids and parents to get active and focus on achieving a goal. My kids and I love Underwater Adventures Aquarium, a walk-through aquarium (they squeal at the sharks and love the jellyfish!). The LEGO Store just re-opened this month and I hear is worth the visit. You could also play a round or two of mini-golf while you’re there and take advantage of the Free Family Flicks program every Saturday at 10 a.m. at the Theatres at Mall of America. 3. Swimming – The best cure for cabin fever for my little ones is swimming. The warm water and super-humid air reminds us of summer and brings smiles all around. We frequent the Maple Grove Community Center, and friends recommend Community Centers in Shoreview, Chaska, Maplewood, and Minnetonka. The Water Park of America and Grand Rios are great for tweens and teens craving more excitement than the average pool, but carry heftier admissions prices. 4. Museums and other learning centers – The Minneapolis Institute of Arts is always free and their Winterlights exhibit about holiday festivities around the world looks interesting for all ages (this is the last week for this exhibit). There is also a special exhibit on chocolate at the Minnesota History Center (last week for this one as well). Of course the Science Museum of Minnesota and the Minnesota Children’s Museum are always a hit, so add them to your winter list if you haven’t been there lately. 5. Midtown Global Market – One of my favorite places in the Twin Cities, the Midtown Global Market is a large indoor market featuring international shops and restaurants. Located in the Midtown Exchange Building in Minneapolis with easy ramp parking, the market has a fun vibe and offers a great educational opportunity for kids and parents alike to learn about other cultures. Consider bringing a world map (print one off the internet if you don’t have one handy) and encourage children to talk with store owners about where they are from, marking the country on the map. 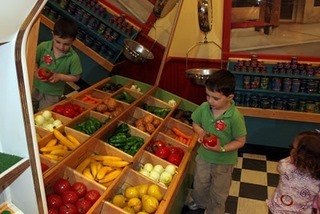 They also feature “Wee Wednesdays” educational events for little ones each week. 6. Stages Theatre – Take the pre-school and elementary crowd to see If You Give a Moose a Muffin, running Jan. 14 – Feb. 13 at Stages Theatre in Hopkins. A comedy based on the book of the same name, this show will surely be a hit with young ones and parents. Shows run weekdays, evenings and weekends and prices are wonderfully affordable compared to other theatres in town. 8. Indoor play areas – The soft play areas in the mall may work for toddlers, but bigger kids and tweens enjoy the larger, more exciting indoor playgrounds, such as the Edinborough Park Playpark in Edina, the Eagles Nest in New Brighton and the Maple Maze in Maple Grove. Admission prices are reasonable and some places even have wi-fi for parents supervising from the sidelines. 9. Fun at home - outdoors – Tired of sledding and snowmen? Add some color to your white yard with snow painting. Use empty squirt bottles (think shampoo, ketchup bottles, etc.) and fill with water and food coloring. Then set the kids free in the backyard to make a masterpiece. This idea comes from a local blogger, read her post about it here Save Green Being Green. Another fun outdoor activity is to make snow ice cream! All you need is snow (make sure it’s clean), sugar, vanilla extract and milk. Check out this easy tutorial from the TLC Web site. 10. Fun at home – indoors – If you can’t leave the house, you’ll need to get creative. Science projects are fun for kids and beat watching TV or cleaning their rooms. 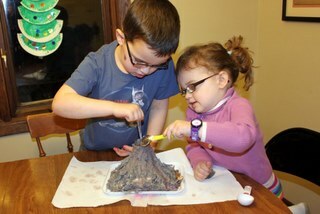 We made a volcano over the weekend and had fun watching it erupt (see it in action here: The Marketing Mama – Make Your Own Volcano). You can find many science experiments from the Kitchen Pantry Scientist, a local mom and scientist who encourages parents to do simple science experiments with their children on her blog. Is your child ready to take on new responsibilities around the house? For example, can they sort laundry by color or put away dishes by themselves? Although it may not be fun a week from now, I always find the first time I allow my children to help me with a new chore, they are typically really excited about it -- and so am I! I hope this list inspires you to try some new activities and make the most of your family time together! What activities do you enjoy when the weather keeps us mostly indoors? Missy Berggren is the author of The Marketing Mama, a leading Twin Cities parenting blog. A Minneapolis-area mom, Missy juggles a full time job as a marketing professional while raising two young children, ages 3 and 5. She frequently writes about family activities in the Twin Cities, as well as specialty topics such as breastfeeding, food allergies and featuring products that make life easier for parents. Missy is a founder of the Minnesota Blogger Conference and was named one of the 2010 Twin Cities Top Ten Titans in Social Media. You can follow her on her blog, on facebook and twitter.